Manifest Blog: To Tattoo or Not to Tattoo? 1. This verse is applying to pagan rituals that God didn’t want the Israelites participating in. Tattoos today are purely adornment and not ritualistic. 2. This verse refers to Old Testament law. We’re under grace now, so we don’t have to follow the law. The issue that I struggled with was that while tattooing may not always be ritualistic in our culture; it’s still very ritualistic in other cultures today when they worship their gods or the dead. I also had a hard time when looking at some of the other rituals included in this Leviticus passage: eating blood, divination, soothsaying, purposefully cutting yourself, selling your daughter into prostitution, not keeping Sabbaths, not revering God’s sanctuary, and turning to mediums or spiritists. Are these things we can do as long as we’re not ritualistic about it? Likewise are these things we should go do just because we’re under grace now? Paul writes, “I would not have come to know sin except through the Law.” (Romans 7:7) He also writes, “What shall we say then? Are we to continue in sin so that grace may increase?” (Romans 6:1) We are not under the law, but we should not purposefully seek to break it and sin either. If all the law would be fulfilled by, as Jesus says, “Loving the Lord your God with all your heart, soul, and strength and loving your neighbor as yourself.” (Matthew 22:37-40) Then getting a tattoo, having been restricted in the law, must somehow be an unloving act toward God or others. When I came to that conclusion, I decided against it. After all, did God not fearfully and wonderfully form me in my mother’s womb? (Psalms 139:13-14) Is my body not the temple of the Holy Spirit? (1 Corinthians 6:19) Would I graffiti the temple of God and defend my actions as artistic expression? That’s not revering God’s sanctuary, which you’ll notice is in this list from Leviticus too. Here’s the thing: grace is being forgiven for not loving God with everything you have (sin), so that you can love Him the way He loves you (righteousness). The Old Testament law is founded on loving God with all that you have to offer. 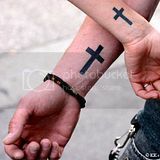 I could not bring myself to sin so that grace may abound and get a tattoo. I just couldn’t do it. I couldn't agree with you more, Stephen. God created us beautifully and wonderfully. We are His temple and we are not our own. God didn't make us with tattoos. This is a great article, especially this day in age. ! It used to be that getting a tattoo made you different. Today, to not get one makes you different. You made a unique choice.